Playing WIth Math: Can We Keep the Campaign's Momentum Up? Sol Lederman posted his interview with me, at Wild About Math. It's part of his Inspired by Math podcast series. It was fun to do. I think it will be fun to listen to. While we are visibly posting and tweeting, we are also putting some finishing touches on the book behind the scenes. Today Erik and Martin Demaine agreed to share their beautiful artwork with our readers. We will be including this piece in the book. Here's another review. I like how each review reflects different facets of the book. This is from Melissa Greene, and was posted at her blog, Reflections from Drywood Creek. 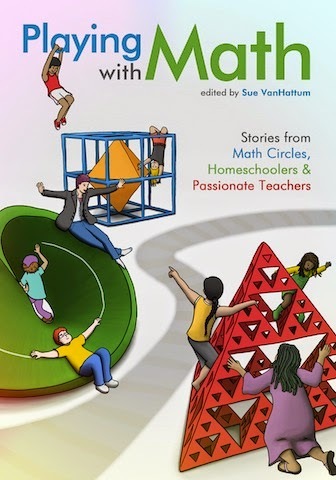 I was recently sent a manuscript copy of Playing with Math: Stories from Math Circles, Homeschoolers & Passionate Teachers edited by Sue VanHattum. Playing with Math is definitely not a math textbook. It's a conglomeration of helpful stories and examples of how people who love math are sharing that love with others. The book is divided into four sections: 1. Math Circles and More: Celebrating Math; 2. Homeschoolers Do Math; 3. Passionate Teachers: In The Classroom; and 4. Resources. Each section starts with a brief introduction followed by stories from a variety of authors. Each story is followed by an example of various math games, puzzles and problems for you to try. In Math Circles and More, I learned that groups of people gather to work on math problems together. There are math circles, math clubs, and math festivals. Math lovers even put together math trails where they map out an area and provide math questions that can be answered by observing that surrounding area. Go figure! (...no pun intended :) I had no idea that people actually gather to solve math problems for fun. Math Circles and More provides unique stories by people who have started or participated in these groups. I was inspired at the possibility of gathering in a math club. Homeschoolers Do Math starts off with stories from bloggers you may recognize, Julie Brennan of Living Math! and Jimmie Lanley from Jimmie's Collage and the Notebooking Fairy. Both ladies, among others, share anecdotes about doing math while homeschooling. Each mom shares her journey on helping her child become successful with math, from overcoming personal fears, to turning math haters into math lovers. The stories of Passionate Teachers are shared in section three. These teachers rise above standardized tests, government mandates, and miscellaneous grading policies to help children succeed with math both in the classroom and for life. The introduction states, "Good teachers have always worked valiantly to provide a rich learning environment for the children in their care, and to overcome the limitations imposed by the structure of schooling. In this section, you’ll get a peek at a few teachers who discuss their work and their struggles online. One of the themes is how textbooks get in the way. We’ve ceded much of our power to textbook publishers, and finding ways to move beyond the textbook can be very powerful." As a homeschooler, I can personally say that I've let textbooks rule my way for teaching math because of insecurity. I think homeschoolers and classroom teachers alike can glean from the wisdom here. Finally, the Resource section is packed with a plethora of ideas to support you whether you are a novice or math aficionado. There are online resources and living math book lists. I enjoyed perusing the Meet the Author section. You can click here to learn more about Playing with Math. There is a brief video by VanHattum and information for purchasing the book. I can see Playing with Math being very popular amongst math lovers and not so much math lovers looking for a survival resource. It appears to have something for everyone. Preview: Today I was interviewed by Sol Lederman for his Inspired by Math podcast series. He'll post it tomorrow. We had lots of fun talking about math and the book. He asked me what math is, and I got scared for a moment that I wouldn't have anything much to say. I got over that hump. "Playing With Math" came along at a very fortuitous moment for me. I'm a homeschooling mom (teaching my 11yo, 9yo & 5yo, boys) who also happens to be a certified math teacher with classroom & tutoring experience. I've just moved to a new town and was thinking about starting up math circles in my home as a way to jump-start math learning for my boys. When I began homeschooling years ago, I thought I had to find the "best, right curriculum" for my son to achieve math mastery. I've been moving away from that idea slowly but surely over the years (with help from the Living Math group and especially Julie Brennan's posts). I have taken a lot from the Charlotte Mason methodology as I've implemented my boys' education, and feel like a "Playing With Math" or Living Math approach is the right way to go. Now, to unlearn my "teacherly" ways, and relearn how to let the kids and math lead the learning! This book is the ideal place to start. I would highly recommend the book Playing With Math to any parent, teacher, or homeschooler, as it offers a new way to look at math and how your child/student would benefit from a completely different approach to math. This book is filled with inspirational stories from parents, teachers, and homeschoolers, all of which are unique, but convey the same message: we must release our fear that children can't/won't learn math unless it's drilled into them in the "right" order, with the right "curriculum," and embrace exploring math in a totally new way, with the excitement of seeing the beauty in and having FUN with math. Playing With Math also provides a number of math problems, activities and games to get you started right away. Want more? There's also an abundance of references to a variety of other inspiring books as resources. One suggestion might be to add an appendix to the book, listing these amazing resources, categorized by age/grade appropriateness. As a homeschooling mom, this book gives me the comfort of knowing that I DO have the freedom to take my time with math, and allow my kids to learn it at their own pace, and from any level of interest (even if that means talking infinity with my 9yo!). Even though I've been homeschooling for a long time now, it does take a while to learn to trust in your kids' ability to learn, and your ability to teach as a mentor or guide, not a "teller" or "explainer." As a teacher who is not currently in a classroom, but is still tutoring in math, one quote in particular really struck me, from Maria Droujkova: "Adults often strive very hard to get rid of any and all possible traces of confusion for kids, making things dreadfully boring. That prevents kids from developing problem solving skills and other tools for mathematical decision-making." I saw myself in this quote, and quite agree with it. Taking it one step further, I would say that, for myself, this can be an aspect of teacher ego rearing its head. I feel like, if I haven't completely, "correctly" explained a concept until the student confirms they "get" my way, then I haven't really done my job. This puts the onus and reward on the teacher, when really, the student is the one doing the learning. The more a student discovers or explores on their own, the more permanent that learning experience will be. To be fair, as a tutor, I'm often working within time and goal restraints, usually within the context of a system that does not allow for math fun and exploration. (For example, finishing a course so the student can "move on" or "finish up" high school math, or prepping for the SAT which has so much at stake for these kids.) Without quite understanding why, I have been dissatisfied for a while with the limitations of hourly tutoring, which I think is why I have been pondering the idea of doing Math Circles. What fun to be able to explore math with students in an open environment, having no requirements or limitations other than our interest and potential! One final note. This book is all about math, but the fundamental ideas underpinning it are applicable to learning in any subject, and for students of all ages. If looked at from this perspective, you can take away so much more, especially if you are interested in ideas about learning and education. I hope this book accomplishes all the goals the authors have for it, and more: to inspire people everywhere to see the beauty and joy inherent in math and in playing and puzzling with math ideas by starting their own groups, supplementing their child's education, or even taking their students'/children's whole math experience in a completely new direction. Bernie, Fawn, Ben, Chris, John, Shireen, and Laura (geekmom extraordinaire) have all written lovely posts about the book. Here's one more. Debbie McDuffee is one of the 5,000-plus members of Living Math Forum. She wrote this to share there, and with a number of other homeshool groups. I asked if I could share it here. I want to thank Sue for making her manuscript of Playing with Math available, and I cannot tell you how much I enjoyed this book. As someone who has my Master's in education, I've read my share of education books, both assigned and because I am completely passionate about the subject. I can say without hesitation that this book is truly special. Sue, you've really got something great here! What a lovely, comfortable book, a relaxing conversation between people from all math backgrounds, that you can read and let sink in. Or, you can follow the sparks it ignites. Or, you can wonder, research and continue to spark. Or you can compile what works for you and your kids from all of the anecdotes in the book and reinvigorate or even, dare I say, redefine, math in your household or classroom. This book has so many purposes and I truly wanted to start reading it again as soon as I was finished (and I will ... many times!). And it's the kind of book you will get more from every time you read it. Sue's writing style sets a comfortable dialogue between the author and the reader right away. It's not preachy, judgy or really particularly instructive. Instead, it's a party of anecdotes that got this reader excited about not just doing math with kids, but playing with math myself, just for the fun of it. They say that the best education is when you focus on yourself instead of your child, so you can be the example, and this book inspires me to do just that. Playing with Math also helped me understand math circles like no other. I've looked at various writings on math circles and none have spoken to me the way Playing with Math has. The balance of accessibility without talking down just works for me. It's not trying to be didactic, but the mix of many experiences allows me to construct my own ideas of what math circles can mean in my own life with kids. Oh, and I literally had web searches open as I was reading this, searching for things like "Waldorf coloring math facts" and "math olympiad problems" so as I read, I amassed a bunch of resources to get started at the same time. The Moscow Puzzles book is available on Amazon for $3.99 prime! The other thing that strikes me is that the different examples within a topic, while all demonstrating the main theme of "playing with math," have varied enough approaches that there really is something for everyone to glean. For example, in the math circles section, two of them definitely resonated more for me than the others, even though there was valuable information in all of them, and I'm sure I will pick and choose different elements from all of them that work for me. The Homeschooling section's wonderful blend of anecdotes, advice and examples did the same. I love that there are example problems and math games and activities sprinkled throughout the book. What a perfect idea, since everything about the book is so inspirational ... you can start learning right away! The "Passionate Teachers" section literally made me respect teachers more. I love knowing that there are still teachers willing to step out of the box and do what is right for the kids. Reading this section reinforces that creativity is alive and well in the classrooms ... I hope more and more teachers can be inspired by this book. As if all of this wasn't enough, the "Resources" and "Conclusion" sections are filled with more places to find ideas, both online and in books, tips for mentoring, how to support girls, and so much more. This books is truly one of the most well-rounded I have read. While it still sticks to the theme and doesn't try to be everything mathematics, it thoroughly explores "playing with math" and what it can mean to the reader on many different levels. It is evident how much work and passion went into the making of this book. What an amazing collaboration! Thanks again Sue, and everyone who contributed. On Twitter, Sam Shah just said I was an expert on Math Circles. Funny, I still don't feel like an expert at all. My teacher responses, built over decades, seem to interfere. For me, it's easier to host a math party or a math salon. So much is coming together today... I have finally made progress on getting the Playing With Math website to look the way I want it to. Looking over the history, I was reminded that a colleague had pointed to the site a while back, when it looked just silly. I thought I'd reply to her post, and got wandering around on her blog. Holly Graff wrote the chapter One and a Quarter Pizzas for the homeshooling section of Playing With Math: Stories from Math Circles, Homeschoolers, and Passionate Teachers. On her blog, Unschooling Days, she posted last year about a math salon she was running at her home. Lovely post, which includes a delightful video I wanted to share here. Want to write a review of Playing With Math? Contact me! Playing With Math: Stories from Math Circles, Homeschoolers, and Passionate Teachers is finally going to press. After 5 1/2 years of work, I am ready to send it out into the world. We expect to publish this fall. In a recent series of posts, I shared the short bios our authors and artists have put together so you can see what an exciting group of authors we have, then I shared the Table of Contents so you can get a small taste of what's to come, and finally I shared the short reviews a few people wrote that will appear on the back cover of the book. Now we need some longer, meatier reviews. If you would like a copy of the manuscript to review, just email me at mathanthologyeditor@gmail.com. I will send you a pdf. If you can post your review on June 20 or close to it, I would be delighted. That's when our crowd-funding campaign at incited.org will begin.